As we check into the Meson del Marques, our Hotel in Valladolid, we see Bob and Nancy sitting by the pool. Unbeknownst to us they had moved directly from Merida to here, and again we are staying in the same hotel. 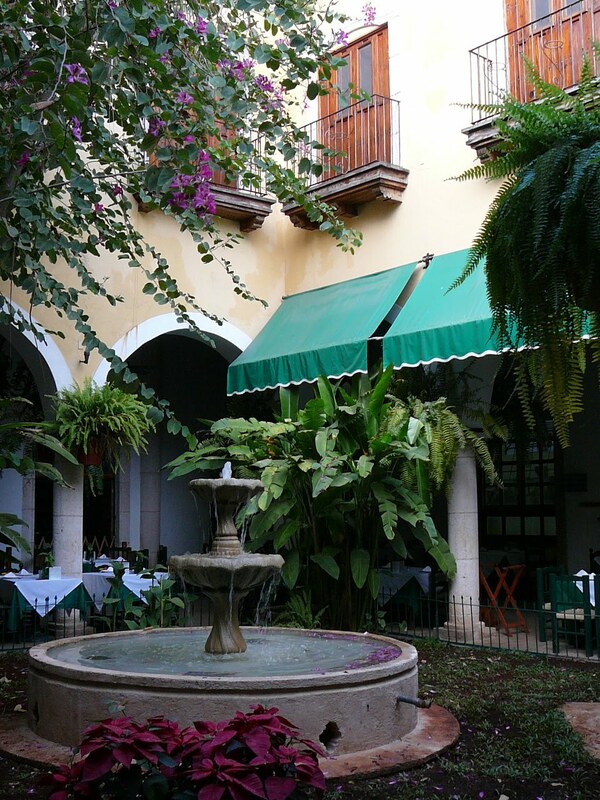 Valladolid is remembered by most people for its charming colonial streets and beautiful 16th century monastery built over a cenote. We will remember it for the family of American hippies who played in a bar and called themselves “Eden”. We, along with Bob and Nancy, listened to them perform and spend some time with them afterwards. The group consists of the parents and two of their children. The two children, wouldn’t you know it, are named Eden and Eve. You couldn’t get more 60’s flower power than that, and it leaves us to ruminate on what the names of the other four children might be. Yes, these happy hippies have managed to sire a total of 6 children. We cannot bring ourselves to ask the names of the other four, but quietly giggle at the possibilities. The father is named Jhimi, and yes, that is spelt Jhimi, and yes, that is pronounced Jimmy. The mother’s name, unlikely as it might be, is Tracy . She has long out grown that name and we are surprised that they haven’t come up with something more suitable by now. They play four songs at a local bar and are very good, and then they sit at a table hoping that someone will buy their CD. 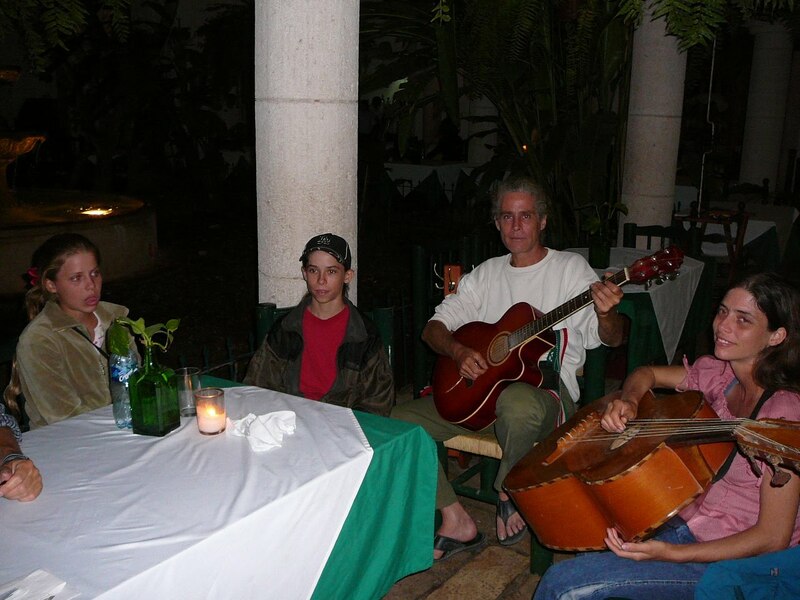 Later that evening they turn up at our hotel restaurant and play the same four songs. We talk to them and discover that years of illegal substances have taken their toll on Jimmy. He is 52, and looks every day of it. He is rail thin with long grey hair drawn back into a ponytail. When he talks he reveals several missing teeth and more missing brain cells. He is 16 years older than Tracy and they fled to Mexico when her parents objected to him dating their young daughter. How young she was then I didn’t like to ask, but 6 children later she is still small and very pretty. They live in a tiny Mexican 2 room house that they inherited from a friend who died of alcoholism. They exist on the sale of their CD’s, which they sell for 80 pesos ($6). and when we ask how many CD’s they sold tonight, Eve proudly replies “one”. Tracy explains that they are very good at living on very little, which must be the understatement of the year. We ask what was the most number of CD’s they ever sold at one time and they tell us about a Music Festival they played at where they sold ten of their CD’s. We could have sold a hundred, Jhimi says, but we had only taken ten with us. If you think you are beginning to understand “where they are coming from”, then just wait for the next question, which is do they get paid for performing in these bars. The short answer is NO! Tracy’s explanation is that places do offer to pay them, but then it gets all too annoying as they want them to turn up at a specific time, and on specific nights, which is never going to work, she explains! And for our final insight we learn that the children are home schooled and are fluent in Spanish and English and are now learning Mayan. We are impressed, until Eden, who is 15, asks where Tennessee is. When we simply reply that it is a State, he asks what a state is. Tracy covers for her son, by saying that they think teaching their children about herbal remedies , gardening, and how to raise chickens, is more valuable than so called regular schooling. We want to buy a copy of their CD, but they refuse to take our money. Jhimi tells us that he would never take money from friends. We are touched, but think that maybe Tracy would be more willing to accept the money as she has eight mouths to feed. But she too refuses. We graciously accept the CD while feeling terribly guilty. The CD has a tiny hand print on it, which is the handprint of their baby. When we get it back to our room and play it, it has variations of the four songs that they played in each bar tonight. We get the sinking feeling that they only know those four songs. This entry was posted in Valladolid. Eden. Meson del Marques. Bookmark the permalink. 2 Responses to And on to Valladolid. Jhymmy is a great friend of mine from many years ago. Back in the early 2000’s I met Jhymmy and Tracy when I lived in Valladolid. At that time they lived in a larger home on a smaller piece of land. I went back to visit them in 2007 at their current location. A few things about this family: they require no money, except for a clothing budget, to live. They grow everything they own on a parcel of land. While their living conditions may seem poor to us, they are actually typical o the people who live in their area. Jhymmy is actually a very accomplished musician. I have the first album he ever made in Valladolid and it consists of 10 tracks of guitar and drums with him doing all the vocals. He met his wife when she was 19. She was working on his set while he directed a documentary for national geographic in California. I miss Jhymmy and Tracy greatly and have searched for some time for his email address. Any information that you could offer would be appreacited.